The Cavaliers met the season a bit awkwardly, fumbling the greeting during one awful stretch of the first quarter of the opener against the Chicago Bulls. Though they dug a hole in that game they wouldn’t climb out of, their upward trajectory hasn’t slackened. Indeed it’s growing more vertiginous by the hour. The Cavaliers have won 10 of the 11 quarters since that one, showcasing depth, scoring, moxie and timing that’s surprising. It’s almost embarrassing how good the Cavaliers have looked at times. The team barely played its starters in the preseason and seemed destined to endure some rough patches while guys gelled. Apparently that took about 12 minutes. Like a Louis XIV breakfast buffet around the Hope diamond, a full range of positive signs emanates outward from LeBron James. We need not return to the whole narrative of James’ time at Heat University, but there’s no doubt that James returned a more mature human being, and that has filtered down into his game. During the season last year, James at first struggled to know how to lead these guys. At times he hung back like a father letting the kids F it up so they might learn a lesson from the mess. Other times he tried to dominate and lead by example. The way the last half of the season became an ISO fest is emblematic of how James wound up take the lead, and everything flowed out of him or Kyrie. That came to its logical conclusion with James performing as the one-man offensive band against the Warriors. Yet that might have been strangely necessary for all around. James understood in his bones (which must’ve ached like hell after that Warriors series) his need for others to share the load and sometimes allow others to walk point figuratively (/militarily)-speaking. The team in turn learned the true value of defense and seemingly great faith in the coaching staff. Everyone knew they had to be more intense and driven than their opponent to get to the Finals, and they almost did it, but seemingly just ran out of gas a few miles from the finish. Perhaps that wasn’t the worst either inasmuch as last year’s champagne party for the Warriors at the Q certainly seems to have everyone’s eyes on the prize. The easiest thing to cite is the offense, so let’s work backwards and start at the other end. It’s only three games but against playoff contenders with top talent. From their fourth-best Defensive Rating (points allowed per 100 possessions) at 90.3, to allowing the fourth fewest 3s (playing Heat & Grizzlies doesn’t hurt), 8th lowest opponent 3-point shooting percentage and the seventh-best defensive rebound rate. As was noted after the Memphis game, this is a much deeper team than last year, but perhaps even more than that, it’s full of guys who know how to play the game and have been playing together for several years. Matthew Dellavedova, Tristan Thompson and Anderson Varejao have been together for three years now. Add wily sweet shooting vet Richard Jefferson, a 15-year vet, and you have a second team with a good understanding of each other and the game. Those four guys led the team in +/- (scoring margin while on the floor) for the second game in a row. Obviously part of that is the fact that the Cavaliers have cruised to victory their last couple games. But it’s also a testament to how much better the Cavaliers second team is playing than all the rest. Delly credits the playoffs and playing for the Australian national team this summer in an entirely different role than the Cavs for the confidence he’s shown with his shot and on the court. Not only has he demonstrated grit, but less hesitation. He looks more like a threat out there and defenses are treating him that way, opening up his real talent as a passer. Delly had 10 assists, 2 secondary assists and a FT assist without a turnover against the Heat last night. 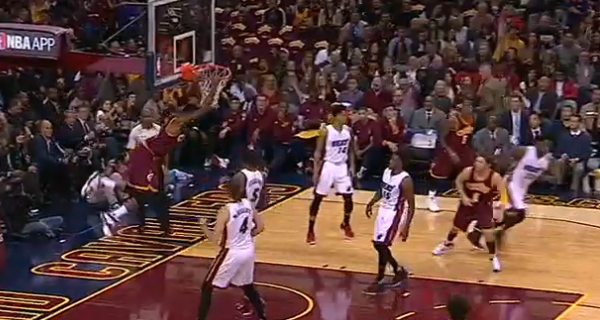 He also had this beautiful alley-oop feed to Tristan Thompson. In Thompson and Varejao, the Cavaliers have maybe the quickest, most active bench frontcourt in the league. Bringing in Jefferson gave the Cavs a legitimate bench scorer, and Jefferson has thrived as the go-to guy on the second squad. When Mo Williams downshifts to the second team upon his return, and perhaps J.R. Smith as well when Shumpert returns, it’s going to be a scary squad. All of this brings us perhaps belatedly to Kevin Love. Last season’s third wheel has moved to the fore like a monster truck tire transplanted to the front of a basketball-style “Big Wheels” child ATV. Obviously it looks more like a motorcycle now with James providing the rear wheel drive, but Kyrie will presumably fall in beside. Not that James necessarily is going to always take a backseat to Love as he suggested he would in interviews that pegged Love as “the offensive focal point.” After working out on a balance ball in the locker room pregame, James’ back looked good enough for 13-19 and 29 points, as well as four assists. After saying earlier in the day he only wanted to take contested jumpers like J.R. Smith, he did just that going 9-13 on such shots (versus 4-6 on the uncontested ones). Many were at the rim, where he was 6-9. Another development has less settling for jumpers and 3s. After averaging nearly 5 treys a game last season, he’s cut his attempts by a third shooting only 3.3 triples per game through the first three contests. If that should holds, it will hark back to his first three years in Miami and the lowest frequency of his career. It’s obviously far too early to put much stock in stats, but it represents what the eyes are saying and the coaching staff as well. The Cavaliers will be distributing the load more evenly this season thanks to greater familiarity and confidence. It shows with a ball that isn’t sticking anywhere and defensive rotations that suggest everyone believes their teammate will get their man and cover their back. They look like a unit and the buy-in looks deep. The struggles of last season were the kiln and with David Griffin’s fine off-season lacquering of Jefferson and Williams this team looks like it could be a museum piece. Such hyperbole would be foolish at the beginning of the season, but it’s becoming increasingly evident that the 33-3 record they put together as a whole unit at the end of last season was no mirage. The team defense that took the Wine & Gold to the brink of the summit has become a part of their personality. This season’s beginning isn’t really anything novel in that it’s very much a continuation of last year’s success. However it’s surprising to see them pick up the thread right where it left off. These guys look crisply focused and energized. This is clearly not the end of the story, but it’s a helluva nice beginning. Look for our column on the Scene blog the day after every game. You can follow on Twitter @CRS_1ne.